The image processing in Content Studio allows an administrator to force specific qualities to images that are added to a category. All size alteration will keep the original ratio (scale). Therefore, writers and editor do not need to use external (third-party) image editors for most cases. Image processing is executed every time an image is uploaded. When an image category is synchronized, all images are updated with the current (possibly modified) setting. The created files are named based on the name of the originally uploaded file. The original file keeps its name (MyImage.jpg). The image that is adjusted for the web gets the postfix '~__H' (MyImage~__H.jpg). The thumbnail gets the postfix '~__T' (MyImage~__T.jpg). 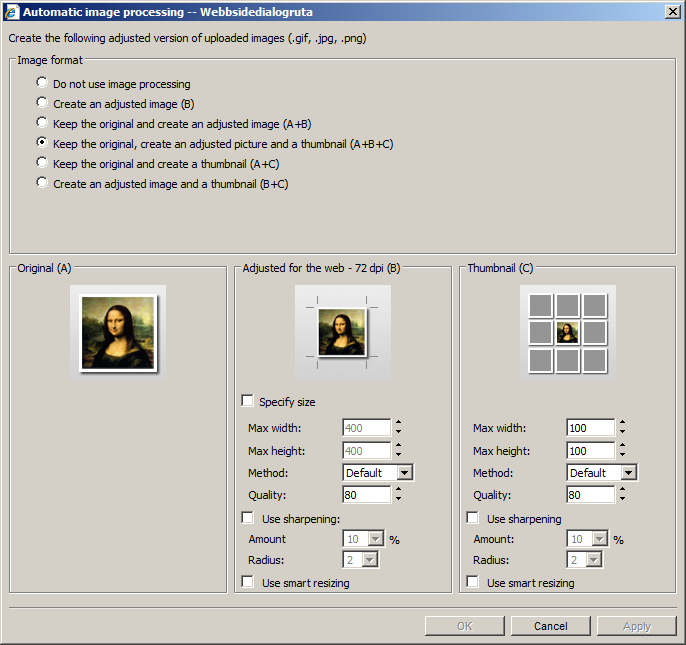 The image processing dialog can be accessed via the properties of categories containing binary files. This section defines which image formats that should be externally available. Content Studio always keeps a copy of the original image internally, to enable synchronization of the images if any settings are changes at a later stage. The image synchronization must be initiated manually (not done automatically). This section shows the setting of the original image, which is saved to the disk. The image is not processed or modified. This section shows the settings of the (optional) adjusted copy of the original image. The image is adjusted to be used within web documents by making the image file smaller and with limited display size. If a maximum size is given, the images are scaled to fit within the limits, provided that the original image is larger than the maximum size. If the image format does not support resizing, the meta data is change to reflect 72 dpi resolution. If no maximum size is given, the image resolution is read from its meta data. If the resolution is higher than 72 dpi, it will be scaled (sampled) to 72 dpi. The Method field described which interpolation filter to use for sampling. More information is found in the section Image filters. The Quality level is only used for compression if the image format allows it. Currently, compression is only used for JPEG images. Low quality numbers indicate high compression with low picture quality and small file size. By adding image sharpening, blurred pictures may seem sharper by exposing pixels that are distinctively different from its surrounding. 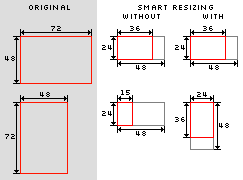 With smart resizing, the picture orientation is investigated. If the image uses portrait orientation, the given values for maximum with and height will change place. See the illustration below. Read more about dpi, dots per inch on Wikipedia. Generating thumbnails use the same logic as when generating images adjusted for the web. The exception is that the size must be selected. The image will hence be rescaled for the given size. The dpi meta data will be set but it will not be rescaled according to the new dpi settings. Image filters are used to interpolate new pixel values when the size of an image changes. The purpose is to maintain the image quality as good as possible. All image filters work in similar ways, but they differ in the priorities and weight of the surrounding pixels. The diagrams below illustrate how the different filers use the surrounding pixels. Note that the grid is included to illustrate the relationship between the pixels; it is not a measure of the number f pixels included in the actual calculations. When an image is made smaller, many pixels will be used to determine the setting of each new pixel (as if there were many pixels within each square in the grid). There is no filter that is optimal for all scenarios. Therefore, it may be necessary to test different filter to fins the one that is best suited for each category.